Cheers, Peers & Beers: After Work Socializing in the U.S.
From office-wide happy hours to holiday parties and corporate retreats, work events are often characterized by a more relaxed but professional environment, casual chats with colleagues, and include alcoholic beverages. Though these events are often a wonderful way to connect with coworkers and interact with the power-players, they can also be monumentally disastrous without modern manners. However, no need to fret, we are here with the necessary Do's and Don'ts of work event etiquette to help you enjoy the night and find a balance between personal and professional behavior. 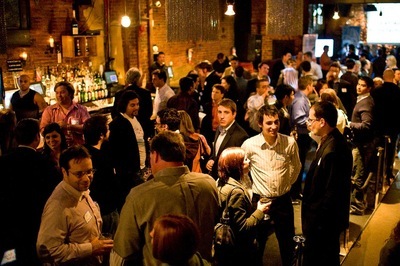 Many companies and their employees go out for drinks on a regular basis; sometimes after work and some may even partake during meetings or conferences. However other company cultures may be vastly different and alcohol is prohibited. Depending on where you are and how long you've been at the company, take time to research, adjust and learn about what is acceptable, expected, and comfortable for you and your colleagues. Whether it's grabbing a snack at the office before you go, or having a quick dinner before you leave the house, this is a MUST do. Eating before an office-wide event will lessen the potential effects of alcoholic drinks and help you remain more comfortable and professional. Protein snacks in particular will help to mitigate alcohol's possibly irresponsible consequences. We know, it's professional common sense. Remember to relax, keep professionalism in the back of your mind, and just try to perceive yourself from your supervisor's view. While you engage in conversation, have a drink, channel your sophisticated self, but ultimately relax and be yourself. We know you'll be great. You spend the majority of your week surrounded by these people, and work events (with or without drinks involved), can be a professionally comfortable venue to get to know your co-workers better. Remember to talk to people you see every day, and also branch out to new people. By connecting with multiple colleagues from all areas of your organization, you are able to create possible mentors, references, and contacts that can help your career down the line. These events can also help you to bond with your coworkers, and have been known to lead to long lasting friendships. Take advantage of the opportunity. Go make some friends and connections! Perhaps you have just moved to a new city or country and wish you knew more people to arrive with. This is understandable, but this is your chance to make those connections. Research shows that by not attending events, and after-work activities with colleagues, employees can be perceived by their peers as disconnected and even uninterested. Whether it's talking to a specific superior, making new friends, connecting with people from a different department, remember why you are at the event. It's not to take advantage of the open bar or get some free food. Keep the notion in the back of your head that this is still a professional gathering and a chance to put your best foot forward. This is not a personal happy hour. I repeat, this is not a personal happy hour. Your gorgeous new low cut tight dress you've been waiting to wear out to the bars should stay in your closet. Its day in the sun (or the moon rather), will come, but your work happy hour is not that night. Men and women alike, take note that this is still a professional setting. Dress sharply, and clean cut in an outfit that helps you feel confident in yourself. Research shows that whether we want to or not, our brain makes split decisions about others based on their appearance. Dress in a way that does not send red flags to the brains of your colleagues. If you are glued to your phone all night, you will miss out on key face to face interactions with your colleagues. The snapchats and texts will be there when you are done. Also keep in mind that social media captures everything. Be aware of this when ordering another drink and possibly hitting the dance floor. Although being comfortable at these events is key, don't allow yourself to be overly comfortable. These events are an ideal avenue for colleagues to get to know more than the work-oriented facet of you. However, keep in mind that there is a thin line between sharing happy stories about your personal life and divulging inappropriate information. Remember your superiors may be surrounding you, people who can promote you are paying attention to how you are holding yourself in these situations. If you are glued to the bar all night, two outcomes are surely inevitable. First of all, you will miss out on the opportunity to connect with people from your company, and secondly, the likelihood of drinking too much is certainly escalated. When drinking at events, remember to limit yourself (1-2 drinks maximum), and keep in mind that pacing yourself can keep you from seeming overindulgent. Drink plenty of water to stay hydrated. Feeling lost due to the fact that you don't drink? Worried you might not be able to mix and mingle with your co-workers. Not to worry. Always feel free to order a club soda with lime, soda or drink of your choice. Alcohol consumption should not dictate your success, but having a drink in hand and engaging in conversation with others is key. What's in your drink is irrelevant. Perhaps your boss really lets loose at events, clearly violating these key Do's and Don'ts. This is not an opportunity for you to do the same. Whether it's fair or not, you are still climbing the ladder and your view is not the same as the one from the top. Some company events may have dancing, some may not. If dancing is a possibility, be aware of how your grooves may be perceived by those around you. Letting loose to Beyoncé after a stressful week is a sure fire way to blow off some steam, but may not be the best way to impress your superiors. Feel free to join in with your co-workers, but remember what consequences your actions may have. Yes you all have one thing in common, work work work. However a work-related event is not the time to keep working or discuss office gossip. Keep conversation between a professional and personal balance; classy, informative, and interesting. Asking questions about sports, movies, books, vacation, travel and pets are good topics that focus the conversation on others. Do remember that happy hour events should be fun and casual. Yes, there is a certain level of decorum to uphold, but we have faith that you can handle these Do's and Don'ts, all while maintaining your authentically professional self. No matter how much fun you do or don't have, there is one golden rule. Never drink and drive. Do be aware of what you are drinking and know your limits. Sharon Schweitzer, J.D., is a cross-cultural consultant, an international protocol expert and the founder of Protocol & Etiquette Worldwide. Schweitzer is accredited in intercultural management, is a regular on-air contributor and has been quoted by BBC Capital, Investor's Business Daily, Fortune, Inc., The New York Times, The Vancouver Sun, The Bangkok Post and numerous other media. She is the best-selling, international award-winning author of Access to Asia: Your Multicultural Business Guide, which was named to the Best Books of 2015 by Kirkus Reviews. For more of Sharon's insight, follow her on The Huffington Post, www.twitter.com/austinprotocol and www.facebook.com/protocolww.